Home / Employment and Social Affairs / Employment Related Issues: a Key Aspect Toward Next European Elections? The ninth European elections will take place between the 23rd and 26th of May 2019, when 350 million EU citizens will have their chance to elect the 705 members of the European Parliament. In 2019, the European Parliament will comprise indeed fewer MEPs (705) than at present (751) due to the departure of 73 British members following Brexit. One big change is definitely going to happen during this crucial event for the future of the Union: the British euro deputy will leave (less than some last moment surprise due the strong opposition in London against EU-UK deal). But just five months from the date it seems that this election is already causing more comments than in other years and there is a high risk of a radical change in the existing power balance in the EU. Multilateralism and dialogue have seen better days: a change in direction is underway, with a protectionist and hostile tone being heard among nations. European party politics are in a turmoil before the EU elections. Eurosceptic parties are trying to form alliances to run in the European elections, while on the other hand traditional parties still have no a clear strategy to deal with this threat. Italian vice Prime Minister, Matteo Salvini, wants to join forces with the far right in Poland and with this scope he visited Warsaw meeting PiS leader Jaroslaw Kaczynsky. While the leader of the populist 5 Star Movement, Luigi Di Maio, is inviting populists in Croatia and Finland, even the Yellow Vests in France. The Italian deputy Prime Minister and Minister of Labour, on the 5 Star Movement’s blog, indeed encouraged the “yellow vests” to continue their struggle. Thus it could be highlighted that social and employment related questions are the real crucial issue on which the electoral campaign for this spring European election will focus on, spreading also from another key theme that has to do with citizens security. Many countries in the EU are facing challenge coming from the middle class or from common citizens who are affected by several years of economic downturn. And extreme forces across Europe are busily rejoicing over French President Emmanuel Macron’s Gilets jaunes predicament. 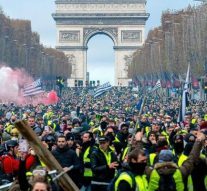 Thousands of French citizens, for whom fuel costs are a major expense, were protesting since November 2018: a proposed hike to fuel taxes was the reason of their anger. Despite the fact that Macron and his government agreed to some of protester’s demands, they keep on protesting against other social issue accusing French president of representing just the wealthy people. France is just an example of a country facing open issues related to welfare and job related questions. And the same themes have high probabilities to be a crucial issue also in the next spring European elections. Furthermore, it has to be said that social and employment protests are a key issue also for populist movement as is the case of Hungary and its prime minister Viktor Orbán that has to face harsh protests over the so called “slavery law”. Hundreds of protesters marched through Budapest and gathered at the parliament building after Orbán’s Fidesz party pushed through legislation allowing employers to ask their workers to take on up to 400 hours’ overtime per year. Critics have dubbed it the “slave law.” The government told that the “voluntary changes to working hours” were “in the interest of the workers” and would allow people to work and earn more. And protest around jobs and incomes characterise even countries around EU but not part of it such as Serbia or Tunisia. All this highlight once more that social and jobs related issues are a top priority for government in order to face nationalistic movement but, at the end of the day, also for populistic movement once they get the power and face day by day reality. « Previous Article New Year Resolutions: What Is Missing in Central Europe?